I’m used to swallowing corn, not vice versa. That’s what it felt like when my feet got sucked into the corn box. We were visiting Port Farms in Waterford, PA with our granddaughter. 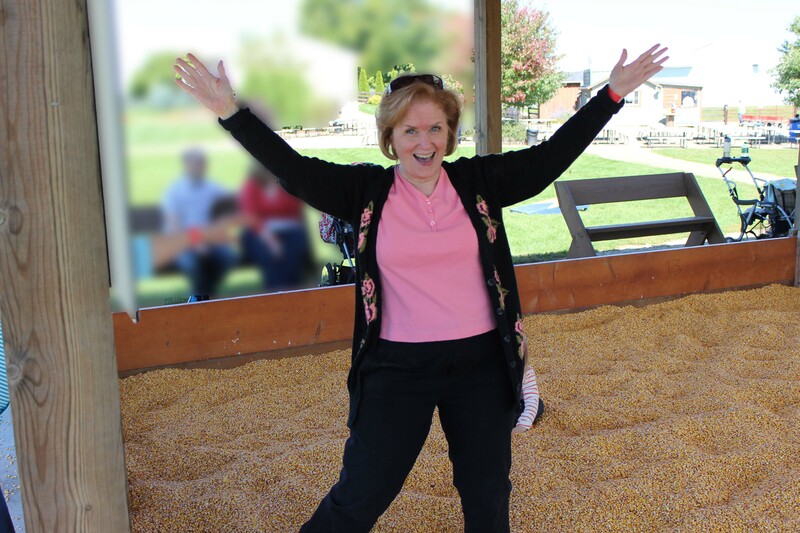 I couldn’t resist the opportunity to frolic in the corn box with her. The sea of kernels felt like quick sand. As I struggled to stand up, I got pulled deeper into the corn. My eighty-seven year old mother leaned over the rail and helped me stand. We all need support from time to time. Moms raising children with mental illness (MI) could use support. But the stigma prevents us from seeking assistance. We’re hesitant to reach out because we fear someone wouldn’t understand. Or worse, we worry we’ll be judged. And then be given unsolicited advice. Yet, we certainly could use support. Logistically, financial, physically, mentally, and emotionally. Help tending to chores would be appreciated. Advice from someone who truly understands could be useful in making decisions (regarding treatment or mental health care providers). Assistance navigating health benefits would be a relief. Certainly a sympathetic shoulder to cry on would comfort our broken heart. In thinking about the word ‘support’ I considered Moses. He faced a daunting task leading more than 600,000 people to the Promised Land (Numbers 11:21). He endured years of struggles because his journey continued for decades. He learned that marathon misery can only be transformed to victory with God’s intervention. Moses witnessed God’s power, longsuffering, and faithfulness. Sound familiar? Your family members come to you with a need and you fill it. “The work is too heavy for you; you cannot handle it alone”: did those words hit you like a sledge hammer? Me? Not able to handle everything alone? That wasn’t the only time Moses needed support. When Moses faced the Amelekites, things didn’t go as planned. Moses lifted God’s staff for his army to see. But, like many of us, Moses got weary. His arm dropped. That presented a HUGE problem. Are you tempted to wonder what would happen if you dropped your heavy load? There’s no shame in needing support. Moses received support from friends. Sometimes God uses reliable friends to help us overcome our challenges. Did you ever notice that you can manage everything until someone complains? That’s the last straw. It was for Moses. 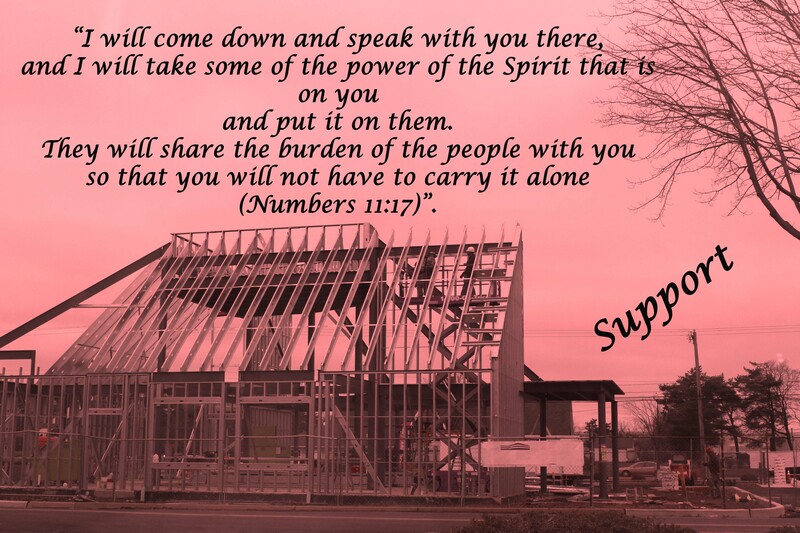 Ask God to ease your burden and provide support. What is it you need from Him? My dad is my hero because he is a great worrier. A great worrier? Could it be that the youngster is impressed with his father’s ability to worry? That sentence doesn’t make sense unless you’re a second grader. It should read, “My dad is my hero because he is a great warrior.” A young boy would certainly look up to a father who is in the military. The spelling of a word can be easily corrected. But it would be vastly harder to transform a true worrier into a valiant warrior. What if the word ‘worrier’ wasn’t misspelled? Are some people great worriers? Moms raising kids with mental illness (MI) know about worrying. We have reason to worry. Anxiety can flood our hearts with uneasiness. We fear our child will hurt himself. Or others. We’re afraid of what will happen next. Or in the future. Our hearts are troubled. We battle anxious feelings. Is it possible to convey how we feel when parental concern turns into consuming worry? The Online Etymology Dictionary describes what it’s like. The origin of the word comes from Old English wyrgan which means “to strangle.” What a picture! Imagine worry as an enemy reaching around your throat, cutting off your ability to breathe. Visualize your hands wringing in helplessness as you succumb to the attack. Now picture your hands folded in prayer. ‘Feel’ the relief of God releasing you from the grip of worry. Take a deep breath of His peace. Many of our children with MI have good days and bad days. On those bad days why do we succumb to worry? Feelings of inadequacy feed anxiety. The dung of doubt tends to fertilize fears. Weeds of worry choke our resolve and crowd out His peace. I couldn’t prevent his condition, so I won’t be able to help him deal with it. I’ve tried everything I know to help her. I’ve done everything her psychiatrist recommended. Nothing seems to work. I’m not equipped to deal with her MI. I can’t face another day like this. I don’t think I can go on much more. Our home—or heart—may feel like a battle zone at times. When we feel depleted, we’re tempted to wave the white flag. And give up. Those are the times to surrender our worries to God. Leaving them at His throne. We approach Him as a worrier and leave His presence as a prayer warrior. What does a modern-day prayer warrior look like? My mom is a great example. She prays unceasingly for her loved ones. Starting each day on her knees. Seeking God’s faithfulness, healing, and intervention throughout her day. Ending the day as she started: bowing before Him in prayer once again. I’m grateful my mother has shown me how to pray faithfully for others. That’s what I love most about her. It’s been a comfort to pick up the phone during a crisis and ask her to pray. Knowing she will. My goal is to leave that same legacy of prayer to my children. Sometimes I feel limited in what I can to do help my son. Remind me that I can provide the very best: prayers offered to You on his behalf. I’m so grateful I have access to You. Knowing You love Chris more than I could ever love him. Knowing You have unlimited power to help and protect him. Knowing You’re with him wherever he goes. 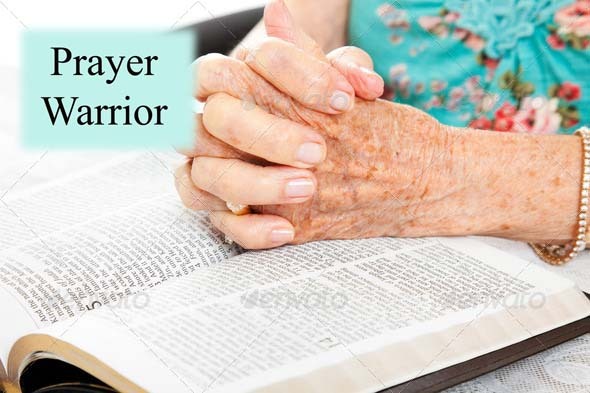 Help me become a greater prayer warrior. It was worse than the teacher described. “Observe my lesson and you’ll see that Rick doesn’t pay attention—at all!” The seventh-grade history teacher invited me to see for myself what he witnessed on a regular basis. As administrator, I provided instructional support to teachers. Often classroom visitations provided insight. On the day I observed, the teacher was reviewing for an upcoming test. Mr. Jones wrote on the smart board. The students copied. He wrote. They copied. Suddenly, he broke the pattern. “This next fact will be on the test. Listen up!” He stated an important date in history, but didn’t write anything on the board. Not one student wrote the critical fact! When the lesson ended and students had left, Mr. Jones was eager to hear my reactions. I didn’t drop that bomb without offering support. Soon after, I taught a mini-lesson on how to take notes. The twenty minutes I invested resulted in better note-taking skills and improved grades. Teachers need students to listen. Likewise parents need their children to listen. Adults require kids to listen—to pay attention and to obey. His desire to listen declined. Mine increased. I hear a sound in the middle of the night and strain to detect if there’s a problem. Chris often sleeps during the day and goes out at night. He prefers working out at his gym when there are less people around. Although he’s an adult, I still find it difficult to sleep soundly when I know he’s out. Moms have perfected the skill of sleeping with one ear open. Merriam-Webster’s online dictionary defines that skill as being ‘alert to catch an expected sound.’ We listen to hear the door open and close, signaling our child has arrived home. Many moms raising kids with MI have also trained their ears to listen to the tone in the child’s voice. Subtleties in their child’s communication help a mother gauge emotional well-being. I’ve learned to be attuned to Chris’s pace of his speaking. Faster speaking lets me know his mind is racing a bit. Sometimes I can detect a slight strain in his voice which signal elevated tension. Careful listening is key. Emotions can block careful listening in children with MI. My emotions affect me similarly. I’ve discovered they block my careful listening to God. I approach God with all my problems and sorrows. Never giving Him a chance to speak to me. I bow my head and my words are off and running. I reach the finish line and say, “Amen.” If I communicated that way with friends, I’d find myself friendless in no time! I’m sure God has things to say to me. In my personal walk with Him, I read His messages in the Bible. And hear His direction for my life through other believers (sermons, Christian radio speakers, saved friends and family members). I want more. I want to learn how to settle my heart before God when I pray. So I can hear what He wants to tell me. I’m finding it so hard to clear the thoughts which clutter my mind. If I can teach seventh graders how to listen better, certainly God can teach me how to hear His voice. Not receiving audible words, just connecting with His thoughts. I’m sure if I seek His help, He’ll gladly teach me how to listen to Him. And I know He’ll do the same for you. 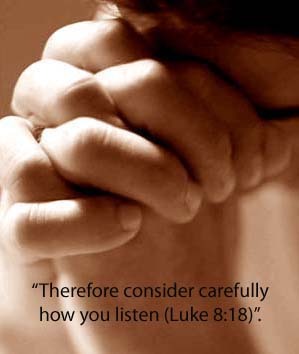 “Therefore consider carefully how you listen (Luke 8:18)”. “I’m thankful I can breathe.” Who would say such a thing? Don’t we all take breathing for granted? Not a woman I know who had multiple sclerosis. Her symptoms are severe. She’s unable to walk. And she can’t talk clearly. Swallowing is difficult at times. Yet, she praises God for allowing her to still breathe. She rejoices in being alive. Breathing is a sign of life. A breath is sometimes associated with strong emotions. A beautiful sunset can leave us breathless. In awe of God’s majesty. Breathing a certain way can be beneficial. Taking a deep breath can restore calmness. Slow, cleansing breaths promote relaxation. Those exercises can even help distract from pain. Ask any mother who relied on them during labor. Even young children can find breathing exercises helpful. When one of my second graders sobbed uncontrollably I’d say, “Take a deep breath….Now breathe out…Take another deep breath…And breathe out slowly…” Gradually, they’d calm down. That method could help a child with mental illness (MI) deal with anxiety. Some individuals may it helpful in reducing worry and apprehension. Breathing can be severed temporarily. By bad news. When someone is told about the sudden death of a loved one, they gasp. As if it’s impossible to take in air, while absorbing the information. Breathing is halted at the shock. Only to resume when tears begin to flow. Do you find yourself holding your breath as you face another day? Not knowing what kind of day your child with MI will have. Not sure what will be required of you. Wondering if you’ll be up to the challenge. As I researched ‘breath’ in the Bible, one passage described how I’ve felt at times. It’s a familiar story in Ezekiel. The Lord gave Ezekiel a vision of dry bones being brought to life by God’s breath. Those dry bones represented people who were hopeless. And lifeless. Dried up. No hope. Cut off. But God promised to breathe new life into His people. Moms raising kids with MI can sometimes feel dried up, without hope, and cut off. We often need to be filled afresh with His Spirit so we can live again. 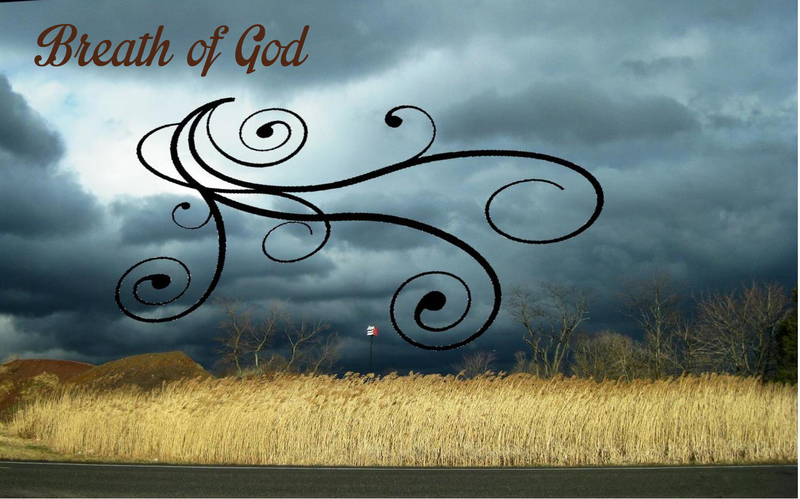 Isaiah reminds us that it is God who gives breath to all people. With His almighty power, He can make all things new. The One who gives breath will take hold of your hand. Do you think your situation is too impossible for God? Consider the story of Lazarus. Christ breathed new life into a person without life.